How Do You Get Red Wine Out of Carpet in Superior, CO 80027? For more articles like this, please see More Interesting Articles For You. When someone spills red wine on a white or light-colored carpet, you need to take action immediately because the longer you wait, the harder it is to remove the stain. Also remember that no matter what method you’re using, do not take a cloth and rub it on the carpet to try and remove the stain as this just serves to force the stain even further into the carpet fibers. Instead, use a clean cloth to blot the stain and soak up as much of the spill as possible. Now let’s see what you can do to clean up the spill! These methods are listed in order of clean up severity. Salt can be poured on the spill to keep the wine from setting until you figure out which method of clean up you would like to go with. Sometimes the best way to treat an alcohol problem is with more alcohol. All joking aside, pour some white wine over the red wine spill. White wine helps to neutralize the spill and prevent it from spreading further. Then you’ll want to blot at the stain until it is removed. If you don’t have any white wine available, try using vodka as a substitute and it should do the job. After you’ve blotted out as much of the wine as possible with a clean cloth, pour club soda over the spill and continue to blot and pull out most of the stain. Club soda works well because the carbonation and sodium components act as a good way to lift the stain from the carpet fibers. Then take four cups of lukewarm water and dilute it with one-quarter dishwashing soap and apply it to the remaining stain. Then blot until the stain is completely removed and finish with water as outline in the white vinegar method above. First, blot the spill with a clean cloth. Next, mix one part white vinegar to two parts water and saturate the spill with this mixture. Then blot the area with a clean towel. Mix one-quarter teaspoon of liquid dish-washing detergent with four cups of lukewarm water and pour a small amount of the solution on the stained carpet. Work the solution into the stain by using a gentle blotting motion. Then use water and a clean cloth to blot the spill and it should remove the rest of the stain. If there is still some stain left on the carpet, refer to the soap and hydrogen peroxide method below to clean up the rest. Be careful when using this method to clean up your spill. Hydrogen peroxide is a bleaching agent so you want to be sure that it doesn’t leave your carpet discolored. If possible, create this mixture and test it on a hidden part of carpeting to see how it reacts. After you’ve blotted the spill with a clean cloth and soaked up the wine, mix two parts hydrogen peroxide to one part dishwashing soap and apply it to the spill. TIP: For extra power, try using a steam iron like in this video. Then take a sponge and dab at the spill until the stain is removed and the area is dry. TIP: For extreme stains, try using a steam iron as seen in this video. Ideally, if you know that you’ll be drinking red wine occasionally, it’s best to purchase a product that’s tested and proven to remove a red wine stain. If you happen to have a really bad spill and don’t want to risk ruining your carpet, you can also hire trusted cleaning professionals like Cleancare of Boulder to take care of it. 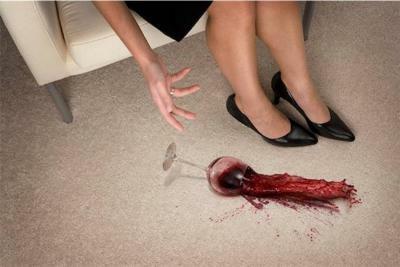 Just remember, whenever there’s a red wine spill, there’s always a solution to get it cleaned up (no pun intended). Try the Best Carpet Cleaning In Superior For FREE!